Weighty Matters: An Employment Lawyer's Take on the McDonald's "Human Rights Violation"
An Employment Lawyer's Take on the McDonald's "Human Rights Violation"
Last week I blogged about the "human rights" case involving a worker at McDonald's who was awarded $50,000 because McDonald's, a restaurant, had the audacity of not creating a job for the worker that did not involve handwashing - this despite the fact that in a McDonald's restaurant no such job exists. In the comments section of my blog there were a few folks who were quite upset with my take on the situation. They felt that I misunderstood the ruling. I felt they misunderstood the ruling. Apparently, the Financial Post sides with my take on the issue as today they weighed in on this "human rights violation". It was Howard Levitt's Workplace Law column that took on the story. "One might think consumer safety should supercede the right of an employee with unclean hands!" 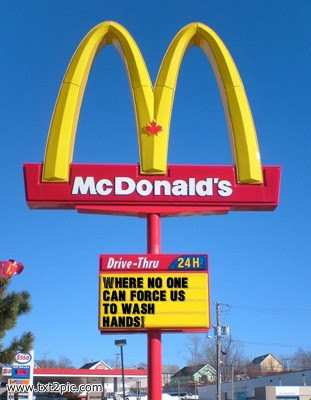 "This is despite Ms. Parrack's acknowledging all jobs at Mc-Donald's require hand washing and, depending on how busy a section is, any position might quickly take over for another." and that the Ms. Parrack also agreed that it may not be possible to create such a position. Not surprisingly, Mr. Levitt has also called for a reigning in of these ridiculous tribunals. Think Mr. Levitt is wrong? Before you do so however you should know that Howard Levitt probably knows a bit more than you about workplace law as he is an employment lawyer who practises in seven Canadian provinces, is recognized by the 6th Edition of The World's Leading Labour and Employment Lawyers published by Euromoney, is listed in all editions of The Canadian Legal Lexpert Directory as a leader in Employment & Labour Law, and is the author of Canada's leading dismissal text book, The Law of Dismissal in Canada and the recently published The Law of Dismissal for Human Resources Professionals.